Playing some simple word games for kids when you read aloud to your child is a fun way to help him learn the skills he'll need to learn to read later on. This is because playing word games is a great way of developing children's phonological awareness and language skills. Why does phonological awareness matter? Studies have shown that phonological awareness is a very reliable indicator of a child's future reading ability. You can read more about phonological awareness at the end of this page or by clicking on the link in the quick links box on the right. For now, though, let's dive straight into some fun word games you can play with your children! So how do you start this word game business? 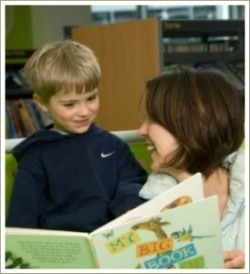 If your child is a baby, he'll just love listening to you read to him. 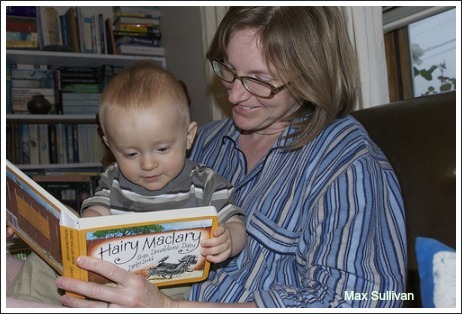 Reading to your baby is important for lots of reasons so start as early as you can and do it as often as possible. As he gets older, start to talk more to him about the stories and poems you're reading. Remember to talk about the words and about the sounds that make up the words. Just a gentle word of caution here: this is not meant to be a boring, learning exercise or something mum or dad gets all anxious and uptight about. It's meant to be fun! Think about all the silly, made-up words and the funny rhymes in some of the best books for kids and talk about them. The Heffalump in Winnie-the-Pooh and Lynley Dodd's gorgeous characters like Hairy MacLary and his friend ' Schnitzel von Krumm with a very low tum' are great examples. If your child doesn’t comment on the way these words sound, you can point them out to him. Read these lines to yourself a few times to get the rhythm of them. Once your child is about three, you can have loads of fun together making up nonsense words and changing the sounds around in familiar words to form other words. Using a favourite nursery rhyme or nonsense poem as a starting point can be fun, although it's not compulsory. It’s really important to remember that it’s the sounds that matter here – not the words themselves or how we spell them or even the letters that make up each word. It’s the sounds that are absolutely crucial. By the age of three or four, kids understand and appreciate humour so be as silly as you like. In fact, playing with silly words is the whole point! For example, if your child's name is James, start by playing with the 'j' sound. Remember: it's the sound that's important so don't call it a 'jay' or 'the letter J' - call it a 'jeh' sound. If your child responds with words like 'jit' or 'jod' or 'giraffe' don't correct him. Again, it's the sound that's important and he's got that right so praise him, laugh and encourage him. It's a game and it needs to be fun! The great thing about simple word games for kids like these is that they can be played anywhere. When my children were younger I found this was a great way of keeping them happy if we ever had to wait anywhere – at a supermarket, in the car or while we were waiting to pick up one of their siblings. Note: again, remember to call this an 'a sound', as in the word apple. If you'd like other ideas for word games to play with your child, there are some great ideas here. For older children (from about four on), "I Spy" is a great game to encourage phonological awareness and word skills in general. At this age you need to modify the game slightly to emphasize the sounds, rather than the letters. So instead of saying "I spy with my little eye, something beginning with P" you say "I spy with my little eye, something beginning with a peh sound". This is a great game to play in the car, especially on longer trips. So, you're reading to your child and playing games with him but how do you know his phonological awareness is developing?